1 Flatbush Avenue is a 14,000 square foot prime corner retail center situated one block from the new Barclays Center and the Fulton Mall. 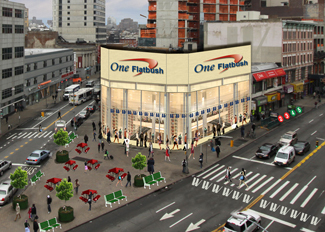 1 Flatbush Avenue sits on the corner of Fulton Street and Flatbush Avenue, a corner location that draws excellent vehicle and pedestrian traffic. The property has 200 linear feet of wrap around frontage and 40 feet of signage opportunity. Over the next five years, an estimated $9 billion in public and private investment is estimated to take place in Downtown Brooklyn, which is expected to produce 14,000 residential units and bring with it 32,000 new residents. Prominent retailers have already positioned themselves near 1 Flatbush, including Macy’s, H&M, MAC, TJ MAXX, Armani Exchange and Chase. © 2019 Capstone Equities. All rights reserved. Powered by BlueSwitch.